CET Training offers a holistic program by veterans with rich industry experience in VLSI design and verification, PCB design, Mat lab, VLSI and LAB VIEW with the core curriculum encompassing all the key skills recognized as significant for a design engineer today. We guide you on the several different approaches used in the industry to crack design problems And our approach in learning-through-experience process of training which inculcate the habit of out-of-box thoughts and practical learning by using our proprietary course material and concept labs. 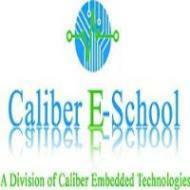 Caliber Embedded Technologies conducts classes in Embedded & VLSI and Embedded Systems. It is located in Sidhapudur, Coimbatore. It takes Regular Classes- at the Institute.